I have found my soulmate. I'd like to say that I'm joking, but I'm truly not. If it were possible to marry a bag, I would marry this one. This bag and I were made for each other. 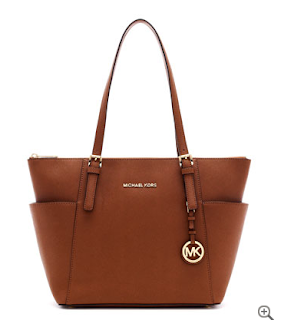 It's the MICHAEL Michael Kors Jet Set (my favorite collection!) Top-Zip Saffiano Tote and it costs $248. It comes in many colors, but I chose this wonderfully versatile caramel color. There are many pockets to hold things (including a large zip pocket that is perfect for holding things that you don't want to be visible when you open your bag like medications or gum and a pocket that is the perfect fit for an iPhone to slip into) and while it is a medium sized bag, it actually holds quite a bit! I haven't tested it yet, but I think an iPad would fit inside. My favorite thing about the bag is actually the top zipper which is the smoothest thing I've ever done; it's like a knife cutting through hot butter! I love that the bag didn't feel out of place when I took it to the movies tonight wearing shorts and a striped top (and a large box of Junior Mints fit inside! ), but it's also pretty enough to bring tomorrow to the bridal luncheon I'm attending.